Aaah. I had a terrific time participating in the Cybils as a panelist for the Easy Reader and Early Chapter Books categories. You can see the finalists for all the categories on New Year's Day on the Cybils site. Check it out and happy reading! One final list of the year . . . our favorites. In creating this list, we indulged ourselves by allowing personal interests and experiences to influence our selections. These are books we love, and we recommend them wholeheartedly. We are a week away from the year's end, and now is a good time to see which books you missed in 2013 that you'll regret not reading. I posted links to some of my favorite year-end lists in November (here and here) but there a few more that are worth noticing. 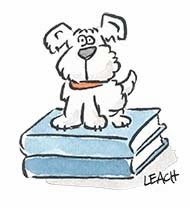 New York Public Library put together a list of 100 recommended titles called Children's Books 2013: 100 Titles for Reading and Sharing. Horn Book's Fanfare list is considerably shorter with only 30 titles. You can find it in their January/February issue or on the blog, Read Roger. 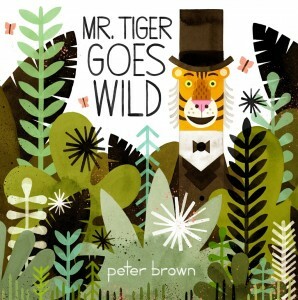 If you are looking for picture books, there are some terrific ones that aren't eligible for the Caldecott Award because their illustrators don't meet the residency requirements. Robin Smith of Calling Caldecott posted a great list--Ineligible Internationals. Don't skip the comments. 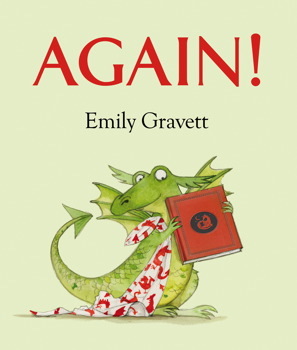 Today is the last day of school this year (cue the applause) and yesterday was the last storytime of the year. Here are December's highlights. We talked about playing in the snow and enjoying hot chocolate afterwards. One student pointed out the change in the city from gray and drab to bright and colorful in Snow. 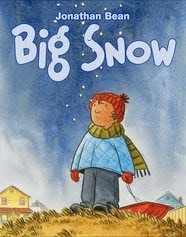 And another noticed the changing colors in Big Snow as the story (and the storm) progressed. We talked about how the snow reflects the light and how the illustrations use light. We looked at the texture in the illustrations for Bunnies on Ice and Extra Yarn. We also talked about the magic behind that box of yarn--every kid had a slightly different idea of how it worked. Jon Agee's Little Santa ends with "And you know the rest of the story." I had several students who wanted to share what they know about the rest of that story. (And one who wanted to know if the book was fiction or nonfiction.) I love first graders. 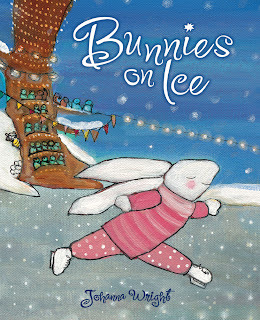 White bunnies in fluffy snow + a touch of ice skating = delightful winter magic. 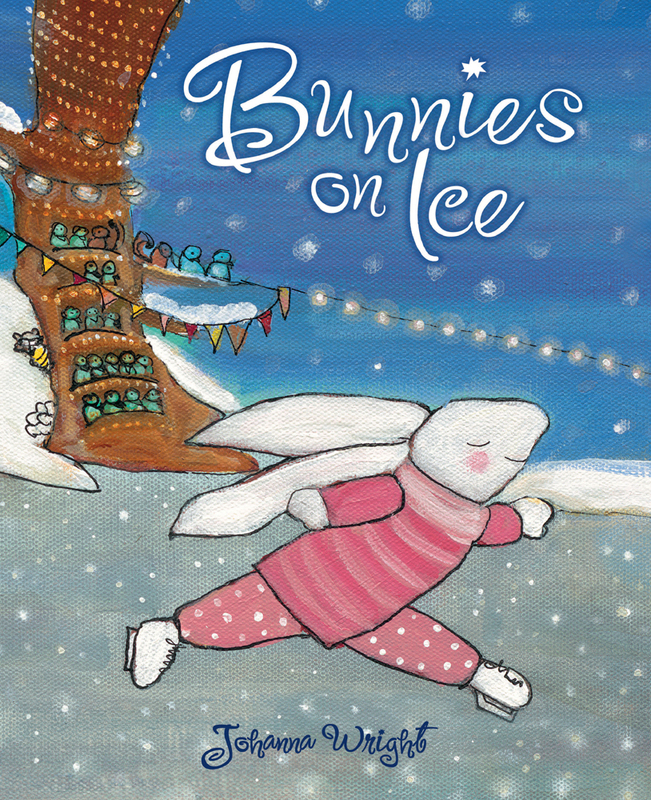 Bunnies On Ice is a charming story about a little bunny who is eager to share her secrets of how to be a "champion" ice-skater. One of these tips include waiting for "the conditions to be just right." That means waiting through spring and waiting through summer and waiting through fall - until finally, it snows! After a big breakfast and a proper wardrobe change, it is time to hit the ice. This little bunny shows off her incredible skills, such as doing "a figure eight with [her] eyes closed" . . . but, as with any supremely confident child, her perception of greatness is slightly exaggerated and the pictures tell a much different story (her figure eights are a mesh of messy squiggly lines and her perfect landing ends in a fall). But, after a hard day on the ice, she has her "excellent support team" and "plenty of hot chocolate," which makes the perfect ending to this cozy winter story. The best part of this book, (aside from the spunky main character and perfect family togetherness), is the art. 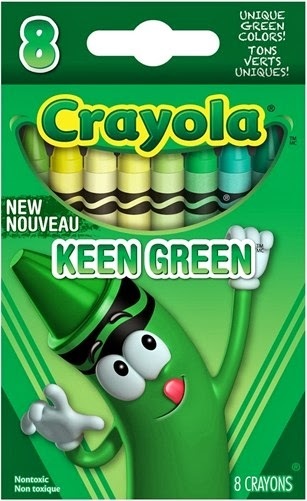 The pictures make you want to touch the pages because of the heavy texture of the canvas and the visible brushstrokes. You are almost fooled into thinking you can feel the raised canvas and paint under your fingertips - and even though you can't (believe me, I've tried), the pictures are still warm and magical. Some of life's best moments are simple ones, yet they can also be elusive because emotional richness and simplicity can be difficult to capture simultaneously. That is why I particularly admire a book for emerging readers, like Me Too! by Valeri Gorbachev, that captures an everyday moment and imbues it with depth, and does it in a way that is easy to read. This story begins on the title page with an eager Bear and Chipmunk watching the snow fall outside their window and welcoming readers into their world. Then with a page turn, readers are drawn inside the warmth of their home. "I love snow!" said Bear. 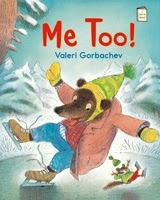 This first page sets up the rest of the story with Bear talking about their activities and Chipmunk echoing, "Me too!" each time. The picture of snow shovels (I love the tiny one! ), ice skates, and skis lined up on the wall also gives readers a preview of what is coming next. The two friends dig a path out of their house, make a snowman, ice skate, ski, and return to their cozy home to sit by the fire. 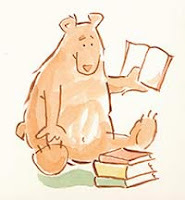 Young readers will laugh as Chipmunk flies through the air behind Bear's snow shovel, when he skis down a hill and lands head first in the snow, and when he and Bear fall on their backs while skating. And they'll understand the warmth that exists between the two friends. After a day in the snow, Bear and Chipmunk tuck into their warm beds, and this time Chipmunk's echo changes. The moon in attic windows draws the reader's eyes across the page, and with the final page turn, the reader is once again outside looking at the glowing lights through the window. 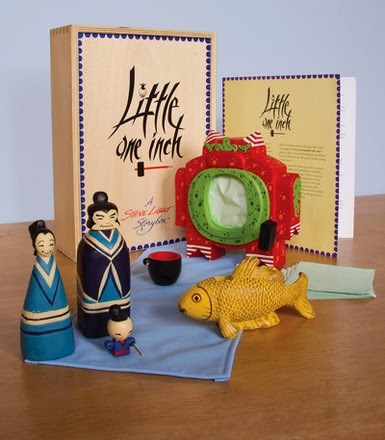 Unlike traditional easy-to-read books, this book is the shape and size of a picture book which makes it perfect for the earliest reader and an adult to share together. The repetitive text uses only 39 unique words (most of which are sight words). Expressive, watercolor illustrations tell the story, and children will probably "read" the story through the pictures more than words. There is nothing complicated here, just a satisfying story simply told. I received a copy of this book from the publisher for consideration as a Cybils Finalist. The opinions expressed are my own and do not necessarily reflect those of other Cybils panelists. I've come late to the Mr. Putter & Tabby books by Cynthia Rylant. For some reason, until recently, I had not read even one book in the series. Yep, that’s almost 20 years and 22 books, and even though I've taught six of my children to read, I had, somehow, missed every book. Until now. When Mr. Putter & Tabby Drop the Ball was nominated for a Cybils Award, I picked it up expecting (unfairly, I might add) a rather stale, late-in-a-series story. I was surprised and delighted to find just how wrong I was. Deciding that I had neglected this series long enough, I took a quick trip to the library and checked out a stack of books. Now after reading through eight books, I've found new characters to love and old books to share. 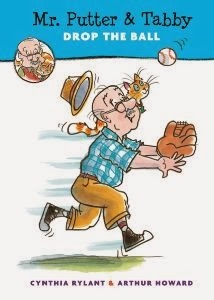 Although I enjoyed all the books I read, Mr. Putter & Tabby Drop the Ball is still my favorite. Mr. Putter and his “fine cat” Tabby love to nap, but they seem to be napping all the time, so Mr. Putter decides they need a sport. His neighbor, Mrs. Teaberry knows of a baseball team that will be just right for him--the Yankee Doodle Dandies--and when Mr. Putter expresses concern about being too old, Mrs. Teaberry offers to join the team with him. They arrive at the ballpark, leave Tabby and Mrs. Teaberry's dog, Zeke, on the sidelines, and take their places on the field. But Zeke doesn't want to be a spectator, so despite being told to “stay,” he runs onto the field and grabs the ball. Just when it seems like Zeke’s mischief will cause the Yankee Doddle Dandies to lose, he finds a helpful way to be part of the game. Told in five short chapters, this book is just what an easy reader should be. Short sentences with easy-to-read vocabulary (most of which newly independent readers will recognize) are surrounded by plenty of white space. Repetition in the text creates rhythm and familiarity. Personality-filled illustrations with bold lines and bright color help pace the story by alternating between spot art and double-page spreads. And they add detail--check out the trading cards at the end of the book. But the best thing about the book is that it is funny. Glimpses into Mr. Putter’s thoughts make Zeke’s antics comical, largely because of Mr. Putter’s silent predictions. “Let’s go play,” said Mrs. Teaberry. “Stay,” she said, patting Zeke’s head. Mr. Putter looked at Zeke. No way, Mr. Putter thought. Illustrations like those of Mr. Putter covering his eyes in exasperation (“Mr. Putter couldn't watch.”) or standing helpless with the ball on the ground in front of him (“Mr. Putter tried to bend down. But his knees said, No way.”) contribute to the humor that makes this book engaging. Hats off to you, Ms. Rylant for putting well-loved characters into a fresh, new story. I love this book. 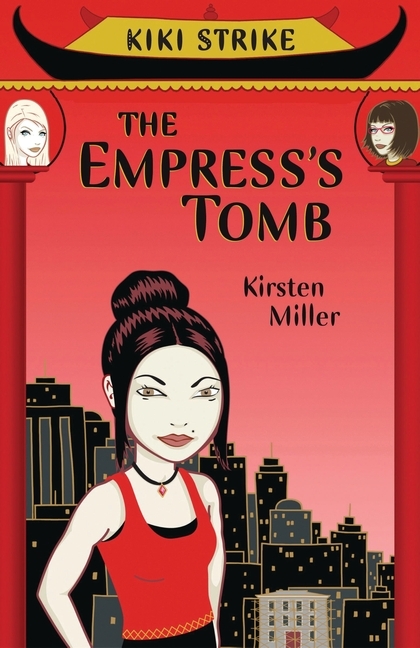 It is a really melodramatic book that shows getting braces and growing up in a way that only a graphic novel could show. Raina is an eleven year old girl who trips and knocks out her front teeth. She then goes from "dontist" to "donist" as they try to figure out how to fix it. The problem is, she is just a normal teenager, she is having friend problems, her body is changing, and she is having boy drama. 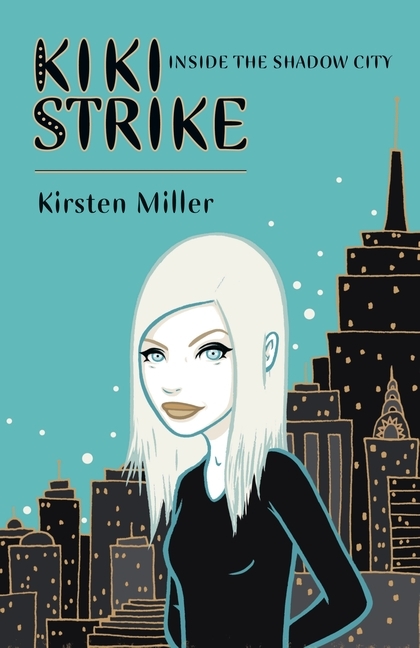 Things keep going badly until her sophomore year when her braces come off, and she gets new friends. This book is based on true account from Raina Telgemeier's teenage years, and it is funny especially if you have had, or currently have, braces. She puts the sounds, the pain, and the embarrassment of having braces in the book. One of my favorite parts is when she is getting her mold for her teeth, (You can see those pages here.) and when she gets her braces off. If you have ever been a teenager, you see it through her all over again as you experience heart break, friend loss, and braces with Raina. And, you can see the first part of the book where she trips here. Lately, most of the time that I apportion to my book habit has been spent reading books for the Cybils, but I have taken time to peek at the year-end lists. I mentioned Publisher's Weekly's list a couple of weeks ago, and now Kirkus has published the Best Children's Books of 2013. School Library Journal announced their choices for the year as well: SLJ Best Book 2013 Fiction, SLJ Best Book Nonfiction, and SLJ Best Books 2013 Picture Books. I am thrilled to see If You Want to See a Whale on all three lists. Some of my other favorites from the year that made all three lists are Flora and Ulysses by Kate DiCamillo, The Thing About Luck by Cynthia Kadohata and Locomotive by Brian Floca. Both On a Beam of Light and Penny and Her Marble are on two lists and The Adventures of a South Pole Pig is included on SLJ's list. 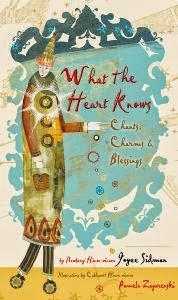 My biggest disappointment was not finding Jonathan Bean's Big Snow or Joyce Sidman's What the Heart Knows on any of lists, but the year isn't over yet, and I'm crossing my fingers. My biggest surprise (because I hadn't heard of it until now) is Rooftoppers by Katherine Rundell. I'll have pull myself away from early chapter books and easy readers to read it. That's my reaction, what's yours? First, I have to say that I love The Tiny King. The "Big Princess" makes me laugh every time I read it. I was a little nervous to use Mr. Wuffles in storytime, but my book club friend, Krystal, convinced me to give it a try with her great alien voice. I read the first couple of pages, and then I took volunteers to read and "interpret" each of the other pages. The children were excited about the upcoming holidays. One little girl enthusiastically shared her story of visiting "Yew York . . . Nuew Nuork . . . you know, where they have that parade on Thanksgiving!" This is the time of year when my lists outgrow post-it notes and start to fill full-size sheets of paper (and sometimes, notebooks). I have to-do lists, holiday preparation lists, ideas-for-gifts and wish lists, and of course, to-read lists. But my favorite lists are the end-of-the-year book lists. 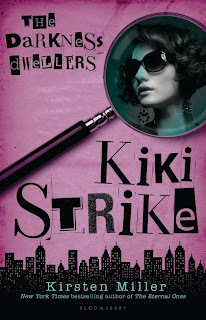 I like finding good books that didn't show up on my radar during the year and reading about what other readers love. With just over a month until year's end, some great lists are starting to pop up. Elizabeth Bluemle of ShelfTalker has put together a list of books that received starred reviews in major publications this year: The Stars So Far--Updated. 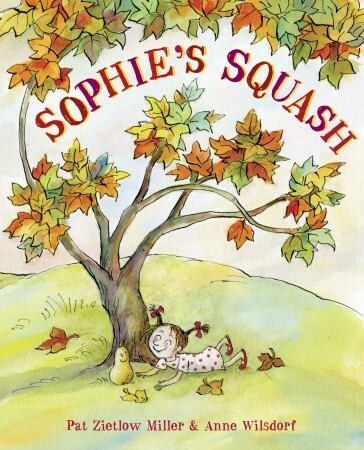 Publisher's Weekly announced their Best Books 2013 lists: Children's Fiction, Children's Picture, Children's Nonfiction. The New York Times published their choices for the 10 Best Illustrated Children's Books of the year. 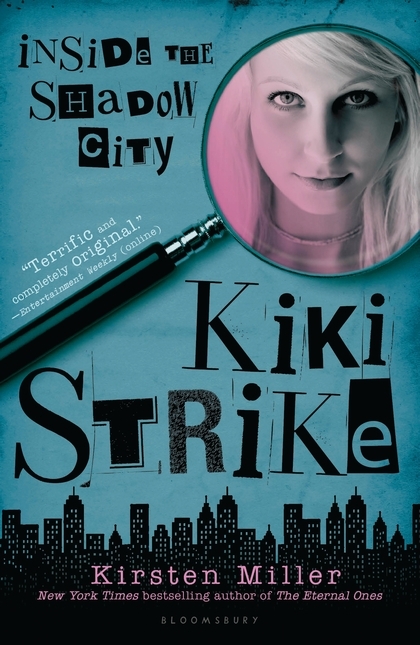 The National Book Foundation announced the Finalists for the 2013 National Book Award for Young People's Literature. And if you just can't get enough lists, check out Heavy Medal (don't skip the comments), Calling Caldecott, and A Fuse 8 Production for more great book recommendations. 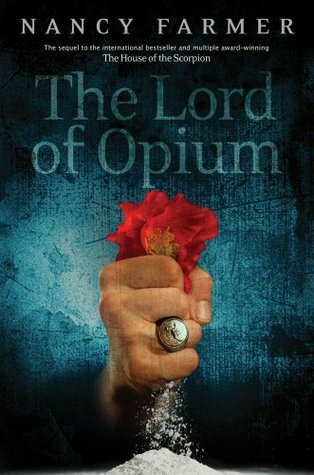 The House of the Scorpion, by Nancy Farmer, was released in 2002 - but I just recently picked it up to prepare for its sequel, The Lord of Opium. If you haven't read The House of the Scorpion, go find a copy before reading any reviews (including this one) about book #2. It is an engaging book that should be enjoyed without spoilers. 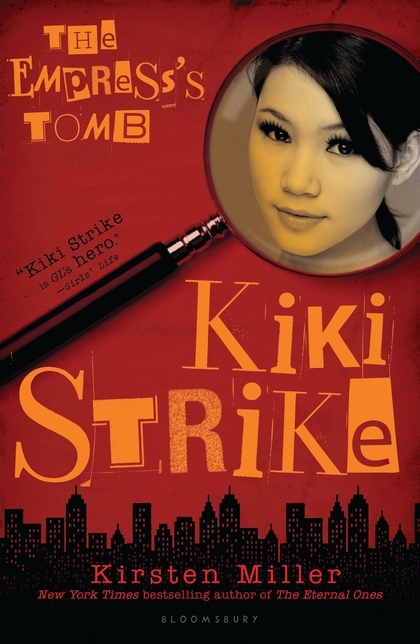 The House of the Scorpion sets up an interesting world with a powerful drug lord at the helm. In this first book, Matt is a clone that was created as spare parts for El Patron (a very old man whose life is perpetually extended by utilizing his many clones). At any given moment, Matt could be wheeled into the hospital and his story could be over and because of this uncertainty, there is a healthy amount of suspense and action as he navigates his relationships. The Lord of Opium begins with a much more powerful Matt as he takes over The Land of Opium, becoming the new drug lord. He is the only one with power to open the border and allow opium to be distributed to the other drug lords. In fact, because of El Patron's tight-fisted control, Matt is the only one with power to make any changes or communicate with the outside world. He is also faced with the high moral responsibility of fixing the eejits (most of the people in the land have injected microchips in their brains - turning them into virtual robots). 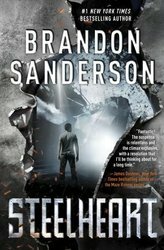 A 14-year-old Matt must now decide whether he will take over as a powerful, ruthless dictator, or find a way to make things right - and every choice is made harder because he is forced to trust dangerous people with questionable motives. Because of the slightly different dynamic of this book, it was not quite as spellbinding as the first. The pacing was a little slow at times, as Matt navigates the politics and mechanics of his new life and explores his kingdom. That being said, this is a worthy sequel to The House of the Scorpion with new, compelling characters, old friends and a neatly wrapped up ending to Matt's story. This book has been out a while, but I really like it, and after reading it several times to my laughing siblings, I decided that I should blog about it. 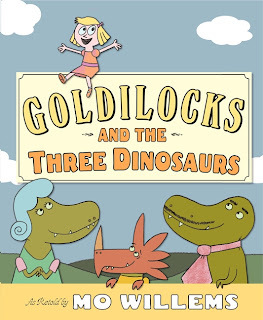 The plot is about what you would expect, except it isn't--the same Goldilocks, but with a twist. "Once upon a time, there were three dinosaurs: Papa Dinosaur, Mama Dinosaur, and some other Dinosaur that happened to be visiting from Norway." "The first bowl of chocolate pudding was too hot, but Goldilocks ate it all anyway because, hey, it's chocolate pudding, right? The second bowl of chocolate pudding was too cold, but who cares about the temperature when you've got a big bowl of chocolate pudding? Not her." Even the moral at the end of the book makes everyone laugh. You can read it several times without getting bored because the pictures have little details that may be skipped on a first, and even second visit. 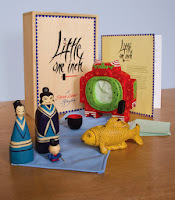 I love the pictures, and, if you look really carefully, you can find the pigeon at least once in the book. You know that oft-repeated bit of parenting advice, If your child refuses a certain food, continue to offer it to him and he may develop a taste for it? Well, although no amount of exposure has helped me develop a taste for mushrooms--no way, no how--I have found that advice to be helpful for not only picky eaters, but for picky readers, as well. Continue to offer (and sample) a variety of books and before long you'll have a reader with expanded reading tastes. 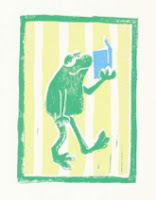 But, here's my confession: Besides detesting supposedly-edible fungus, I am also not a fan of talking-animal books. I can't quite put my finger on the reason for that--after all, it's not as though they have an unbearably squishy texture--but generally, books with animals that talk end up at the bottom of my to-read stack. So, here we are in August, and I have just gotten around to reading the January release, The Adventures of a South Pole Pig, featuring Flora, a talking pig. Flora lives with her mother and her brothers in a cage; well, not actually a cage, as her mother points out, "It's a pigpen." (1) But, it's all the same to Flora who longs to see new things and have adventures. More than anything, Flora wants to be a part of a dog sled team, so when an opportunity to get out of her pen and join the dogs presents itself, Flora takes it. Flora tells the story with her consistently upbeat voice and positive attitude. As she heads to Antarctica believing she will be a sled dog, readers understand that she is being taken on the voyage as food. This irony creates some amusing situations like the time Flora is chained in the ship's hold, and yet she persuades herself to hold on to her dream. With a couple of unlikely friends, Flora discovers how "adventure comes to those who choose it but turns into trouble quick if you don't know how to land on your feet." (46) And through all that adventure and trouble, she refuses to give up. 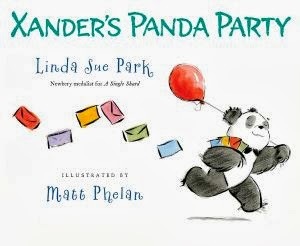 Plenty of action that moves the plot along quickly and clever humor that rises above silliness will hold young readers' interest. But, the best thing about the story is the characters. Yep, that's right, it's the talking animals: Oscar, a dog who is "more than a dog"; Sophia, a cat who changes her solitary ways; and Flora, who tries "hard not to be too piglike." (257) Flora's optimism and her enthusiasm for new experiences make her an irresistible character and make this a book that I'll be re-reading, this time to my kids. Move this book to the top of your to-read stack today. *Chapter 2 makes a great book talk. **A great read-aloud scene is at the end of chapter 35 when Flora and Oscar talk about sled dogs being "a little crazy". See pages 259-260. Because they validate my protective mothering side, I enjoy reading books where conscientious mothers, particularly fiercely vigilant ones, are portrayed as heroes. 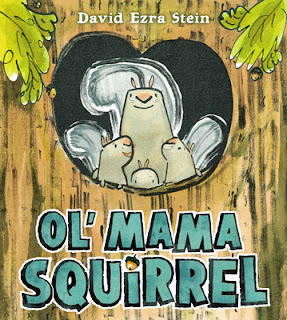 And you won't find a more heroic mother than David Ezra Stein's Ol' Mama Squirrel. Baby squirrels might make tempting snacks for many creatures, but Ol' Mama Squirrel declares, "It won't happen on my watch!" "Chook, chook, chook!" she scolds, and the cat, the owl, and the dog leave in search of easier prey. When a grizzly bear climbs into her tree, she goes at him with a fury, but once he gets over his initial shock, he just laughs. After all, she may be crazy, but she is only a "puny squirrel." But Ol' Mama Squirrel is not easily intimidated, and she scoops up her babies and raises the alarm. While one squirrel may not be a threat to the grizzly, a hundred mama squirrels send him packing. Using muted colors and simple shapes, Stein keeps the focus on his titular character. Ol' Mama Squirrel is the star of the story whether she is shaking her fist at an airplane or waving her arms at a dog. Circular snapshots shows her baring her teeth, swinging a stick, and giving a war cry. Her fearlessness is accentuated with bold, flowing lines and dramatic perspectives -- one that puts the readers right behind her as she faces down the bear. Check out the book trailer, preferably with a child on your lap. 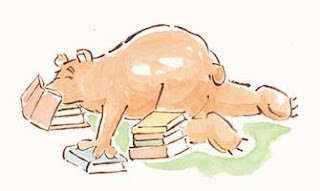 Then read about how Mr. Stein made the art at Pen & Oink. If you want a look at the art for Mr. Stein's newest book, Dinosaur Kisses, head over to Seven Impossible Things Before Breakfast. Don't miss the trailer at the end of the post. The kids are headed back to school, and if you would like some enjoyable and inspiring schooling for yourself, consider attending Utah Valley University's Forum on Engaged Reading. 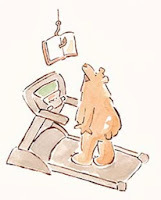 Speakers include Marla Frazee, Sara Pennypacker, Jim Murphy, Loren Leedy, and Jan Pinborough. You can get more information and register here. I read with interest the article, “Summer Reading or Bleeding” from the August Issue of School Library Journal. I encourage every librarian and parent to read the full interview (online here) now, and again in April as they prepare for summer. Consider, that according to Richard L. Allington, “More than 80 percent of the rich/poor reading gap accumulates during the summers. But low-income children gain as much reading growth during the school year as middle-class students.” That statistic should motivate every one of us to help all get kids access to books. Even in schools where most of the students come from middle-class homes, think of the advantage to our students if we were to provide every child “with books they can and want to read.” My children have the benefit of a home filled with books. Further, they have access to books from our public library and from their school libraries, and even better, they have teachers who care about giving them books they want to read. But what of the students who don’t have books “they can and want to read,” especially over the summer? They return to school in the fall needing remediation to catch up to their peers, and that affects all the students. Allington calls on librarians to “get over past-due fines and serving as the protectors of the books,” and instead, to put “as many books in kids’ hands as possible.” Something to think about. Every story begins with a first sentence -- that first impression that is the author's chance to immediately engage a reader. An opening might jump right into the action or give a glimpse of where the story is headed; it might set up a mystery or hint at a theme; it could introduce a character or establish the setting; but whatever it does, a strong opening sentence captures a reader's attention and imagination. "I had arrived early for my own assassination." "If I'd known what there was to know about Early Auden, that strangest of boys, I might have been scared off, or at least kept my distance like all the others." "In the Urwald you grow up fast or not at all." "Back before I shot Mr. Bennett, most every day was 'bout the same." "Kouun is 'good luck' in Japanese, and one year my family had none of it." "This is how Kyle Keeley got grounded for a week."